Obituary for Linda L. Hardison | Rhoney Funeral Home, Inc.
Linda L. Hardison, of Sanborn, NY passed away on Monday, August 13, 2018, at Our Lady of Peace Nursing Care Residence. She was born in North Tonawanda, NY, on February 26, 1942, a daughter of Aletta M. [Kyler] Fix and the late Anthony Fix. Mrs. Hardison graduated from Niagara Wheatfield in 1960 and was a machinist at Strippit Akron, NY, for over 27 years before retiring. 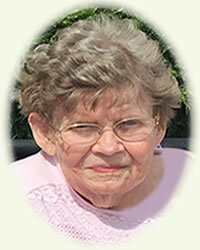 She enjoyed spending time with her family, gardening and cooking. In addition to her mother, she is survived by two daughters, Kelly (Donald) Tubo and Sally (Jeff) Lewis, two grandchildren Jennifer Tubo and Christopher (Jennifer) Tubo, two great grandchildren Parker and Pearl Lynn Tubo. Mrs. Hardison was the mother of the late Hollis "Tony" Hardison, sister of the late Jeffrey Fix and dear friend of the late William Wells. Her family will be present on Thursday from 3-6 PM at the RHONEY FUNERAL HOME, 5893 Hoover Road, SANBORN, NY, followed by funeral services at 6:00 PM, with the Rev. Matthew Kofahl officiating. Memorials may be made in her name to the Hope United Methodist Church.